Have an outdoor dilemma that involves keeping the stuff you don't like out of your outdoor shelter and keeping the stuff you do like in? You can do that and take advantage of some other benefits using this Caravan 10 ft. Clear Sidewall. You'll accomplish the obvious goals without sacrificing any of the things you took to the outdoors for in the first place. 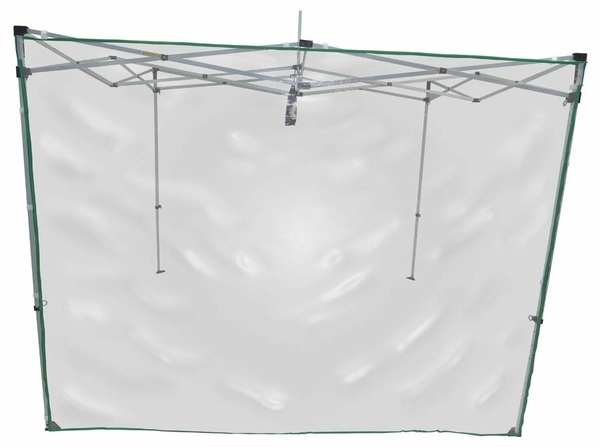 This 10-foot clear vinyl panel attaches easily to any Caravan shelter with an appropriately sized 10-foot wall. Once in place, you can use this sidewall in conjunction with other sidewalls (purchased separately) to create a totally enclosed environment. In fact, there are zippers along the vertical edges that make connection to other sidewall panels (once again, purchased separately) a breeze. And in addition to helping protect you and your friends from wind, rain, floating debris, and bugs, you still get to take in all of the views and outdoor ambience that an outdoor shelter is designed to help you enjoy. Not to belabor the point, but this vinyl sidewall really gives shelter owners protection from some of the worst Mother Nature has to offer without preventing them from being able to see the best. Caravan owners have all sorts of options when it comes to accessories and other additions, and this panel represents the perfect solution for many of them. Your needs may include bug protection, wind prevention, or just overall peace of mind, but whatever those needs are the Caravan 10 ft. Clear Sidewall is an excellent way to address them. WARNING: This product can expose you to chemicals including Diethylhexyl Phthalate, which is known to the State of California to cause cancer, birth defects, or other reproductive harm. For more information go to www.P65Warnings.ca.gov.